Making and consuming large-scale work takes place in small increments, a time based unfolding of viewing. Focus leads from here and now to then and there, occupying an intimate field as understanding and connections develop slowly. Step back and new meanings emerge, stay close to be consumed. 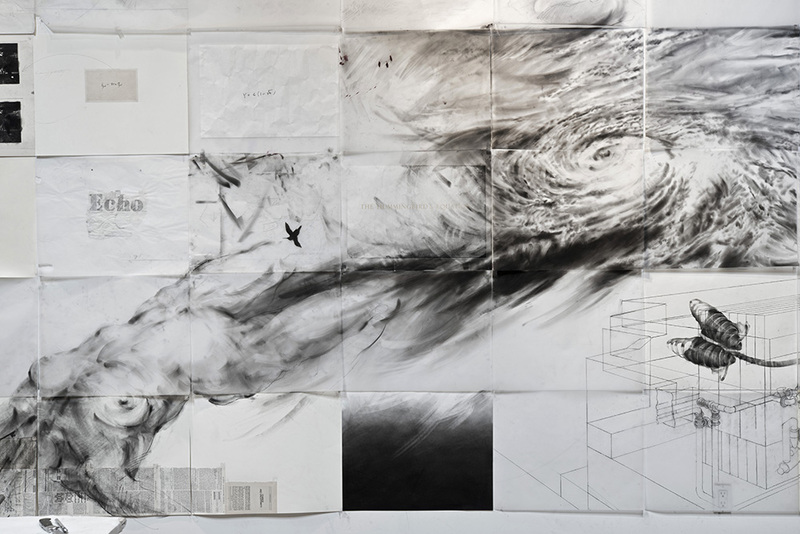 Drake’s installation-drawings force the viewer to remember. Indulge on eclectic details of a highly skilled draftsman: a diagram, tornado, or flock of words drowning in a sea of paper, charcoal, collage, and crayon. Attempt to remove the distance, to breathe and avoid the undertow, and one risks forgetting the specifics.